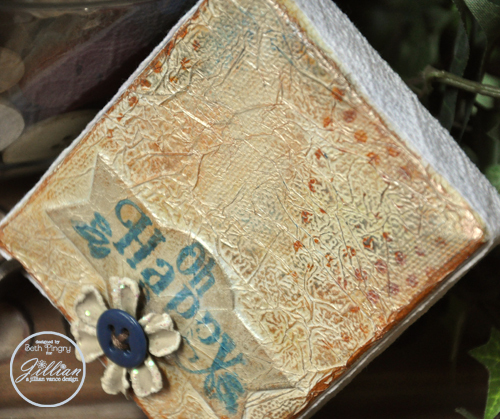 Mini Altered Canvas – Oh Happy! Today I’m on the blog for A Jillian Vance Design with this adorable mini canvas Oh Happy! More details and quick tutorial at AJVD – where I am on the Design Team and compensated with product. Thanks for coming by today! Be sure to check out National Scrapbook Day at Scrapbook Adhesive by 3L® tomorrow – great giveaways going on!! This entry was posted in altered art, Altered Art/Mixed Media, mixed media, SCRAPBOOK ADHESIVES BY 3L and tagged a jillian vance design, altered art, canvas, May Arts Ribbon, mixed media, Prima Marketing, Ranger Ink, SCRAPBOOK ADHESIVES BY 3L. Bookmark the permalink.